One of my favourite TV programmes is a BBC One series called “the Vicar of Dibley”. It ran for about 4 years and I still enjoy re-watching it, although it’s somewhat scary to realise the programme is at least 20 years old. Dawn French starred as the vicar, Geraldine, along with a remarkably unruly collection of parishioners. It was a series about characters and the little details which lead either to the humour or, sometimes, the sadness of everyday life. 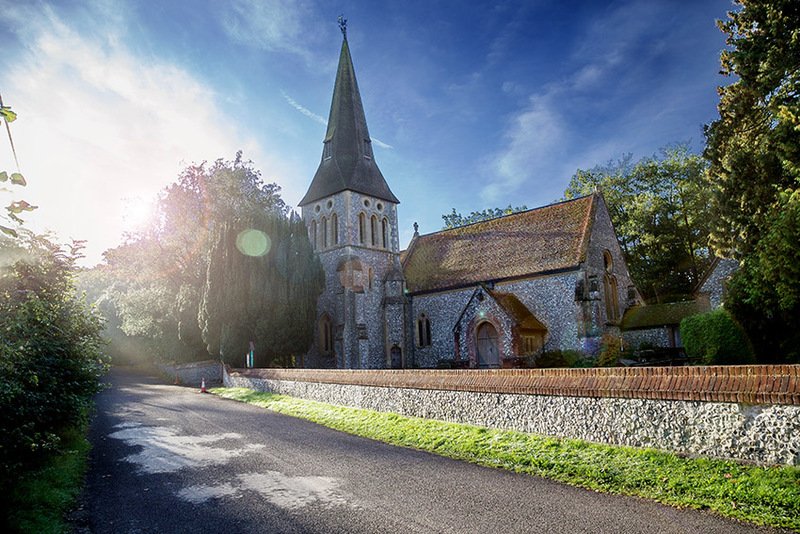 Highclere Church – built by the 4th Earl of Carnarvon when he replaced the earlier, smaller church by the Castle I serve as treasurer for our own Highclere Village Parish Church and attend various PCC meetings led by our vicar, Christine. Highclere is also blessed with a diverse group of members although when I once inadvertently referred to it as just like the Vicar of Dibley and there was something of a frosty silence. For my own part, I am never quite up to date with the accounts but the bills are paid and I always know what is in the bank account, even if the accounts themselves are something of a moving target. Opinions can be given quite forcibly during meetings which are rarely brief and I feel happy to be in the back row of the stalls at such times. One episode in the series which I particularly loved was the animal service episode so I am enthusiastically combining that idea with our own harvest festival service on October 7th. Simon, our farm manager, will hopefully produce a small tractor for the churchyard, some sheaves of wheat, sacks of oats perhaps some sheep, I have lots of apples, flowers and I can, for sure, bring along some dogs. Karine (Hagen) from Viking Cruises may bring some of her puppies to be blessed, Muffet the Shetland pony will be attending and I hope children and families will come along to church and enjoy themselves. The Harvest Festival always reminds me of the changing seasons. The majority of the population live, today, in cities rather than the countryside and this Sunday is all about the life cycles of the countryside. At the current time the UK is debating farming and there is much talk about “farming the landscape”. 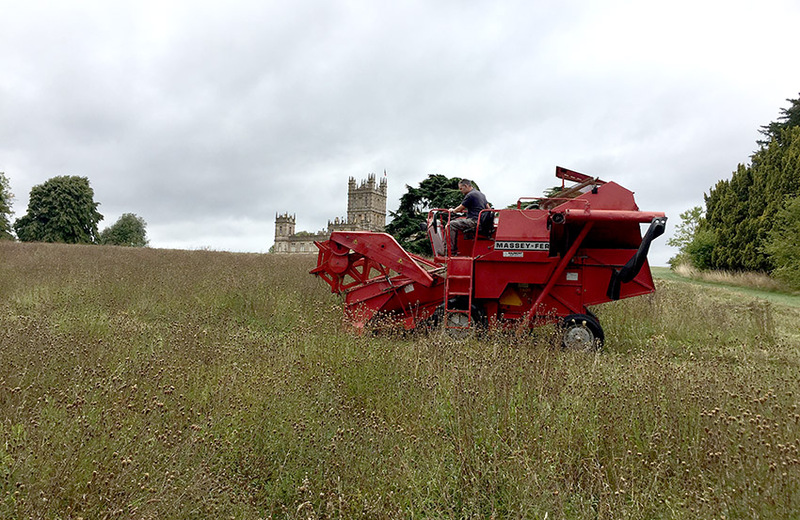 It sounds rather good and I hope Highclere itself is a beacon for species diversity from beetles to bees, from birds to rare wild flowers and other endangered species, but I would also observe that we need to farm for food, we need to eat and to know what we are eating. Collecting the seed from the wild flower meadow. Every country in one way or another subsides farming and food, there is no level playing field, just politics. The debate has also called into question the nature of landscape, the sheep grazed uplands, the man made English parks which we all admire for their “naturalness” or what species of animal should or should not be reintroduced. Interesting times.Although we are all more divorced from the land, we can still tell that the air has changed and that the trees and shrubs are beginning to die down. Sermons and church services tell stories – stories tell us about who we are, our identity and helps guide our beliefs. I wonder if, in the past, it gave us time in a week to think. I hope our Harvest Festival service will be fun but there is no point trying to choreograph it. We have a span of time and everyone is welcome, which I think was the spirit of the Vicar of Dibley. We all sing a hymn called the Hymn of the Hampshire Countryside, which I can clearly remember my father-in-law who had a wonderful voice, singing with gusto – it has many many verses. Geordie continues the tradition very well today. I hope we will all carry on in the same vein for years to come – the ritual and pattern and memories are rather comforting. This year though perhaps the last song should be “Puppy Love”, just like in the BBC 1 series! What a lovely church! It is such a pleasure to see inside. We also enjoyed “The Vicar of Dibley”. the church is just lovely; i also enjoyed the Vicar of Dibley so much i have the DVD when i get a craving to watch. Nothing is funnier that watching her fall in the huge hole of water strolling with her friend! Oh and i love the theme song! My husband and I were lucky to have been on a guided tour of Highclere at the beginning of September. The highlight for me was seeing the contents of the Egyptian Museum. Having been to Tuts tomb and to the Cairo Museum , anything Egypt hold a great fascination. REMEMBER : HIGHGROVE GARDENS AND FARM. PRINCE CHARLES III FROM ENGLAND, THE FILM. VERY INTERESTING MYLADY YOURS WORDS. Your Harvest Festival sounds like it will be a lovely event. I think the idea of blessing the pups is “divinely inspired”!! I will say a prayer that your crops and all the animals are extra blessed. I am sitting here remembering the lovely countryside that surrounds Highclere. I think you have the best of country life in your little slice of heaven. (to keep with the theme of vicars and church!!) This blog post makes me face Autumn with a light heart!!! I too loved the “Vicar of Dibley”!!!! Here in the states, it has not been on our PBS stations for a few years!☹️ Living as I do in Florida, we are truly looking forward to some cooler weather. It has been a long, hot summer. You have such a full calendar of some many different happenings. I’m sure you know you are envied by many, many people. Have a wonderful autumn there at Highclere!!! I look for the Vicar of Dibley on some of the channels here..I rather make up the events although perhaps sometimes I should stop!!! You have graced us with yet another splendid blog. Your ability to paint pictures with your words is a true gift. I believe all of us at some point in our lives have spoken and met up with, as you noted, “…a frosty silence.” I could imagine myself at your PCC meeting and feel the moment. Best of wishes at the Animal Service. I wish I was across the pond and could share in your special day. Thank you again for sharing a piece of your world with us. This was a delightful article, and I could identify with the topic so well even though living here in Texas it is still hotter than blue blazes and the mosquitoes are carrying us away! Fall weather is still some weeks away no matter what the calendar says. I loved the Vicar of Dibley. Our church, St. Andrews, in Pearland, Texas, also celebrates St. Francis Sunday with a pet blessing and our fall event is one of my favorite ministries. We sell pumpkins in our yard from the end of September to October 31st. These make the church surrounded by an orange sea of beautiful pumpkins a very seasonal sight. The pumpkins are not grown here , rather we retail them out from a Navajo reservation the money provides a living for the farmers and their workers plus health insurance, etc. All monies go to missions including a food pantry. The entire community looks forward to the event and dubbed us “The Pumpkin Church”. Enjoy your pet blessing and beautiful autumnal days. The pumpkins sound wonderful – I think early October may be too early for us!! I love Vicar of Dibley! I am a huge Dawn French fan! I’m glad to hear that you are real life Dibley church and trying to carry on traditions that show had. 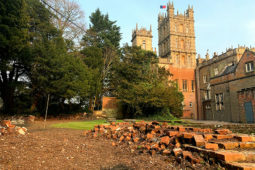 I fell in love with Highclere because of Downton, and now have a reason to love it even more! What a lovely church. Autumn is by far my favorite time of year. The beautiful colors never get old. I live in Ohio in Mohican country. The hills here get beautiful in October. I hope we will have a sheaf or two! That is a beautiful church! Sweet picture of the pups as well. Thank you Lady Carnarvon for the read. Dear Lady Carnarvon: What a beautiful little church. I just love the churches of the English countryside, and that they all look like churches should!! We watched the Vicar of Dibley for years, over here in America, too. I wish they would do re-runs! It was hilarious and we laughed so much during those episodes! For a time we attended a small stone church that dear friends of ours built on their property after the design of English country churches, even importing a 500 year old door from England, somewhere. They made numerous trips to England in earlier years and the churches, and architecture in general is one of my friend’s dearest loves. Her husband is an engineer and built the church himself, from native stone and formed the windows and entry from memory of I think, in miniature, the Salisbury Cathedral. It is used as a wedding chapel now, and is their business. The church was “old” Episcopal/Anglican using the book of Common Prayer, and we loved it! One time, we had the animal service, too!! We had a burro, some horses, dogs, cats, rabbits and I think some birds. It was great fun, and perfect spot, as there is a large meadow adjacent to the church where the animals were kept! Thank you for sharing all of this, it was great memories for us. It sounds like a wonderful event, wishing I could cross the pond for it! You & I share a love for my favorite series!! My favorite episode has to be the Vicar’s wedding! I could watch it 100 times and still makes me smile as a I sing along! Best of luck with your festival and cheers to keeping the traditions alive! I broke down the other day and ordered the whole collection of “The Vicar of Dibley” (available for Region1). In fact, I have a multi-region DVD player so that I can get all my British favorites that are not available for Region 1. My favorite episode is the one where Geraldine blesses the animals, also. I am so thankful to have a small part the the late Emma Chambers work. She also had a great part in the “Martin Chuzzlewit” series. She was a terrific actress. I am, also, amazed at the versatile talent of Dawn French. She really is a U.K. treasure. Thank you for being a bright spot in my day. I always look forward to your communication which is so much more than just a “blog” to me. Thank you for all the important and kind work you do and for sharing it with us. 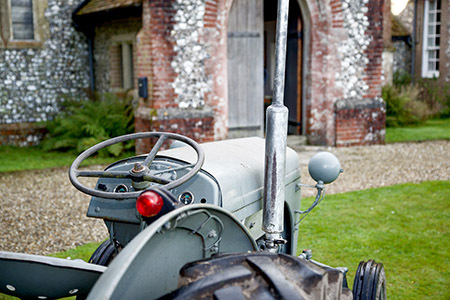 Thanks for the reminder about the country vicar I would enjoy seeing it again and may be I can find it in the TV archives of our local provider! Breathtaking, the interior of Highclere Church. The rose window above the altar. I am Episcopalian (U.S.A., my dad was a priest) So comforting to see the narthex, all. The pictures (?) above the altar……what saints are they? Are they windows or paintings on wood? Id love the details please. The beauty of all things doth appear…..
David thank you – I hope it was ok but I thought the link was most useful and left the first verse .!! Thank you for the heartwarming story about things we two have in common. I, too, love the Vicar of Dibley and my church, St Andrew’s Anglican Church in Savannah, Ga, will celebrate the Feast of St Francis with the Blessing of the Anmals in October. I love your beautiful, Highclere Church. It seems so warm and welcoming, just like the beautiful lady who writes this blog. It was so sad to hear Emma Chambers had died – she was fabulous – I will watch your video! I agree with everyone so far – Highclere Church is lovely. I am also a fan of “The Vicar of Dibley”. I watched it on PBS years ago but it is available now to view on Amazon Prime. Your Harvest Festival sounds lovely. Autumn is my favourite time of year. I love the changing colours and weather and I find it an invigorating time of year. I hope someday to get to Highclere but in the meantime, I enjoy your updates and posts. All the best. I don’t remember seing the church when I went last year. I guess it’s not on the visitor’s path? It is so beautiful!!! I can imagine having holiday services there, it must be so nice! We do have a lavender wall – I love lavender and it all did well this summer! My husband and I also love “The Vicar of Dibley”, and can only imagine that memories of the series pop up when you attend your own council meetings! Hopefully there are wonderful characters amongst your members to make the meetings interesting and the blessing of the animals should be a memorable occasion! It will be lovely to see the Downton movie in a different season from the others – we enjoyed your amazing home, gardens and grounds in May four years ago during a rainy spring and the colors were magnificent! Thank you for sharing Highclere and your good works with us all! I love churches! And puppies!!! And reading your blog – really cheers me up – and I do feel the change of season coming – My Favorite Fall – cozying up, making stews, walks in the woods and even the beaches here in CA are best in the Fall…..
Dear Lady Carnarvon, I loved The Vicar of Dibley! I stumbled across it a few years ago here in the U.S. on Netflix I believe. I ended up watching the entire series. My favorite part of each show was the closing scene with Geraldine telling a joke that Alice usually didn’t get. I was so sad to hear that Emma Chambers passed away this year. I am now watching Dawn French on the series Delicious which is good. We also have a Blessing of the Animals at one of our local churches. I enjoy reading your blogs and was fortunate to visit your beautiful Highclere in the summer if 2016. I think it was shot in Buckinghamshire – not far! Oh how I’d love to be at that service with my two Spanish rescue pups! Wishing you all the best for what I am sure will be a very special (and perhaps somewhat spontaneous and unpredictable) day. What a lovely blog! I was not aware there is a Highclere Church. It is so beautiful. Thank you for sharing the picture with us. 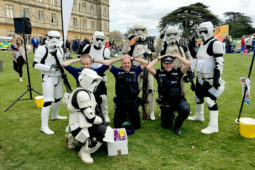 We were so thrilled to be able to attend Heroes at Highclere event. It meant so much to both of us. My husband wore his Vietnam Veterans hat. A lady came up to him and as she shook his hand,she looked him right in the eye and thanked him for his service. Her sincerity brought tears to his eyes. I must admit I have not watched the Vicar of Dibley. But I plan on changing that as soon as we return to Florida. Do you replant the wildflower seeds in the same field? Does the field have to be prepared before planting the seeds in the spring? I find this very interesting! I’m not aware of this being practiced in the US. Thanks for sharing your time and life with us. It was such fun meeting you and Lord Carnarvon. 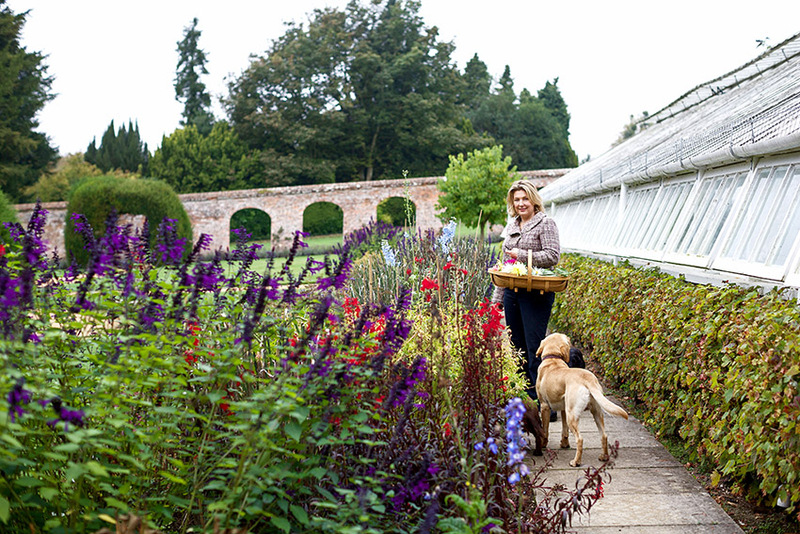 We harvest and package the wild flowers to sell in our shop … you can all have a little bit of Downton! The main thing is take off the grass/hay and thus reduce the nutrients so flowers have the space to grow again next year. We do not interfere and the diversity increases each year. Once a florist, always a florists. The saying goes, “Old Florists never die, our Blooms just hang a little.” That said, I’m looking at your church and mentally decorating it for Autumn, Christmas and a wedding. Great size and balance. We loved the Vicar of Dibley. Geraldine, Alice, Jim, Hugo, David, Owen, Frank…all great characters. It’s doesn’t run on our PBS anymore, but we remember it fondly. Have fun at the animal service. I’m sure they will behave superbly. I am quite sure not it will be fun and not perfect! I too have fond memories of “The Vicar of Dibley” series. Was that, like “Downton Abbey” also ‘set’ in Yorkshire? Best wishes for this weekend’s Harvest Service. It sounds like a wonderful all inclusive event. And what a lovely Church. Unfortunately, at the moment in Australia (& particularly in my home State of New South Wales) our farmers are having a terrible time with one of the worst droughts on record. Indeed the entire State has been declared to be in drought. For many farmers, not only is there little or nothing to expect from a harvest, but there also is very limited or no feed for cattle and other stock. City folk are being encouraged to buy a bale of hay to aid the farming communities effected by the drought. A thought and a prayer for them wouldn’t go astray either. It was supposedly set in Oxfordshire but was filmed in Buckinghamshire! Autumn is my favorite time of the year, when the heat and crowded-with-tourists Greek summers give way to quiet strolls in cool evenings, however, we are still in “summer”, as is most of Europe, so it looks like a delayed Autumn by a month or two? But your lovely blog today brings forth all the colors and aromas of the Fall, and the fine event of the Blessing of the Animals should be quite special. ‘Love seeing your beautiful Labs, what kind dogs they are. 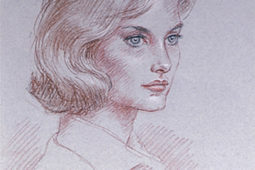 Thank you, again, for a most refreshing and inspiring blog, always a joy to read about Highclere on a Monday evening! I have not been bale to be away much this summer – I missed swimming in the turquoise waters so unique to Greece! It sounds magic where you are! I hope more people will take a walk in the woods – without head phones!! Just listen to what there is.. In our home library I have quite a number of your British comedies including the Vicar of Dibley. Now that I have been reminded of it –I will just have to dust it off and watch it. I loved the Vicar in the series but I think my favorite character is the gentleman with the speech impediment–they are all so hilarious!! 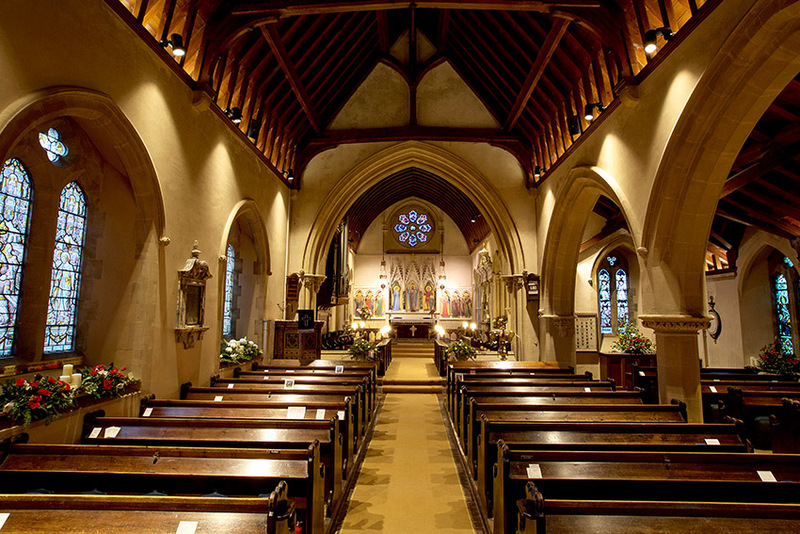 Is that a photograph of inside the Highclere Church–it is beautiful and intimate. The problem with such a small church if you make even the slightest error while singing everyone will hears!!! But never mind the error, the Lord knows what’s in our heart. Best of luck with your Harvest Service. The church my husband grew up in was much like your church. The seiling was like a upside down ship. I always thought it was so beautiful. So topical of the years they sent their men out to sea. Your writing offers such dreamy respites, especially on days that are too busy, or too fraught, or too disappointing. I visited Highclere last year, and though it was “Downton” that drew me to the house, I ended being delighted as much by the grounds, seeing you with (some of) your dogs, and even admiring the shop. Your book “At Home at Highclere” is a worthy souvenir. It seems to me you are so much more than “Lady Carnavon”—you are Businessperson Carnavon, Farmer Carnavon, Author Carnavon, and more. I hope you will consider collecting your blog entries and photos into a book. The Highclere church is lovely. Such a peaceful setting to sense the rays if sunshine filter through the stained glass. I spent many days in my local church praying and learning the songs, in Florida. Coming from a very Catholic island…. The Harvest Festival sounds wonderful, wish I was there…..maybe one day. Still great to read about it through your blogs. Many blessings. This might have already been asked and if so, I apologize: why did they not use the Highclere church for the scenes in Downton Abbey? It is a beautiful church. I would have liked to have seen it when we visited Highclere back in 2016. Thank you for continuing to share your beautiful home and land with those of us who live far away. Always an enjoyable read. Highclere out side is made from flint which is not in Yorkshire where Downton is supposedly set. I did show the crew the inside..
My friend Cynthia Cable and I visited your beautiful home and ground in Oct 2015. Looking forward to reading, once again your most informative and interesting Blogs. Thank you – you stayed with Jo – we always recommend her B and B first – she is also on the Church council !!! What fun to know that one of our favorite TV programs is also enjoyed by you. On Saturday evening, it comes on, along with several other favorites from the BBC. Our local Public Television channel has always been very good about keeping up with our requests! By the way, your photos, and especially those with your prized goldens, are wonderful. I miss my Charlie, now deceased, but for many years a faithful companion to our family. The changing of the seasons from summer to autumn is one of my favorite times of year, as well. “The Vicar of Dibley sounds like a delightful show. Church “culture” is very different in the United States (for lots of reasons! ), and my husband and I have really enjoyed the bits and pieces of English parish life that we’ve experienced during our time here. It seems like part of the glue that holds a community together! Thank you. Interesting reason. Something the normal person would probably not think about but I know the historian for DA was very detailed about those kinds of things. This was the location and set managers all of whom are very hardworking and detailed. Equally Julian Fellowes – the creator and writer is very specific! Love reading your blog! Your estate is beautiful. I also LOVED the Vicar of Dibley. My favorite was the last episode with the wedding. Thanks for opening up your home for the Downton Abbey movie. I’m so excited! Something special to look forward to on the BIG screen next year. I’ve missed my distant cousins from across the pond. Thanks for sharing a piece of what real life is like at Highclere. God bless to you and your family. I love this church! It reminds me of the weddings that took place during the five years of Downton Abbey! So beautiful. Relaxing and uplifting. Our little Methodist church, built in 1860 (old by US standards) sits on the side of the Old Bellamy Road, the oldest federally sponsored road in Florida (1824). A dirt road then and now. The pews, hand hewn by parishioners and slaves, are still in use today. While very uncomfortable, they still work for their intended use. Thank you for your beautiful and descriptive writings. I love reading your writings. This one was particularly fun as we are great Vicar of Dibley fans. When my littlest was about 4, he christened the elderly Englishman who lives down the street “Mr. Dibley” instead of “Mr. Dominic.” We’re now on our second set of DVDs of this series, having worn out the first ones. Harvest time is a special and wonderful time for me as I was raised in a farming community in Minnesota and now that I live a mere 4 blocks from the city limit of Chicago, I try to get my family out of the area most weekends to simply take in the glory of fall. I miss seeing the pheasants in the corn fields, the muskrats building their winter homes in the ponds, and the glorious turning leaves of my home state (I do NOT miss the bears preparing for their winter nap), but I am thankful to read your blog and reconnect with my childhood memories. The Dogs look so happy! 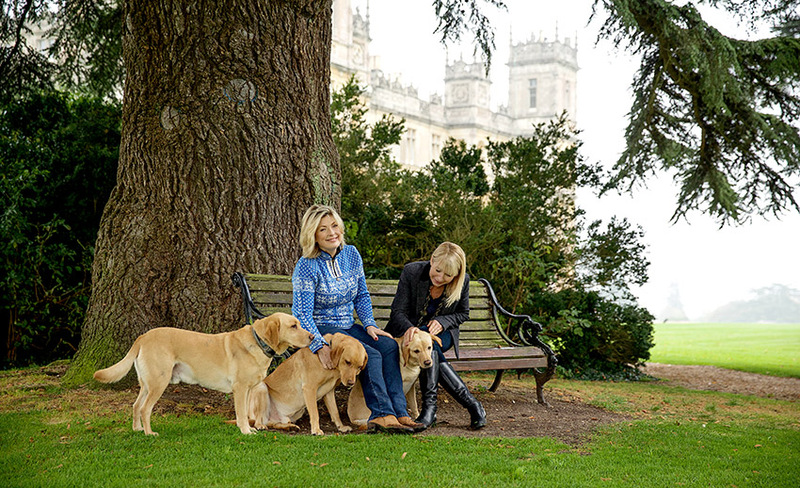 Highclere must be the perfect dog paradise for them. We took our Golden to England last Christmas when she was still a puppy, unfortunately my Mothers beautiful new lawn did not quite look the same after. However a great excuse for my mother to buy some more plants, and widen the flower beds, and for me to finally read the dog training book my wife bought me for Christmas. My very best of luck for the forthcoming filming, my wife Ewa and I really can’t wait to see the film. Beautiful church. Would love for you to post more pictures of it. 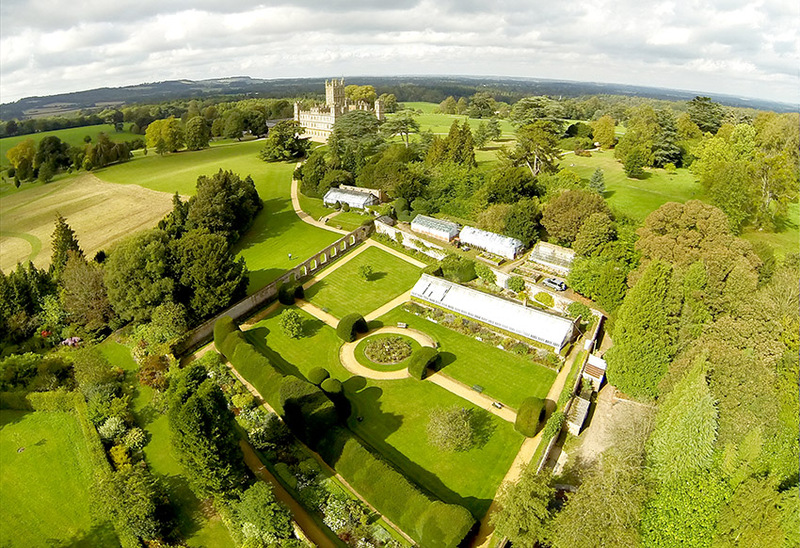 Thank you for sharing this, I always look forward to your blog posts and seeing photos of Highclere and the village. I will have to try to find this show and watch it sometime, sounds really quaint! It is a charming series!!!! Visiting your home was on my “bucket list”; however getting the opportunity to met you in person took it to the next level. Thank you for sharing your beautiful grounds and home with all of us. Lovely to find another Lady Carnarvon, as too am I. Extremely fascinating coming across this when doing a Google search of our family name. I really hope to be able to see it in person some day! I will definitely now be a frequent visitor of your blog!